If you love sunsets then choose a resort that faces the west! Jay and I always have a lot of sympathy for the planner of the family vacation – especially if the vacation is going to include multiple families. Coordinating schedules and picking dates for the vacation is always Challenge #1. However, Challenge #2 isn’t far behind because after you know the when you must determine the where! Lucky for you we happen to be Resort Experts so we’re going to give you some tips for choosing the perfect resort for your Minnesota family vacation! After 18 years in the business we can tell you that there are as many unique Minnesota resorts as there are unique Minnesota vacationers. So the important question really is: How do you like to vacation? Once you answer that question you will be 100%successful in searching out the perfect MN resort for you. Food – If you want a vacation from making meals then choose a resort with a bar/restaurant or one that is close to a community with dining options. You might even consider saving money by booking a suite instead of a cabin with a kitchen. If you plan to cook meals in your cabin then consider the resort’s proximity to shopping areas and whether or not you will bring your food with you or shop for it when you arrive. Also think about what is provided in the kitchen in terms of pots and pans and appliances. Pets – If you want or need to bring along the family dog then choose a resort that allows pets. Some of our guests even choose to board their pet nearby so they can visit and exercise their dog during their week at Wildwood. Whatever you do please don’t sneak your pet into a resort that doesn’t allow them. It really is disrespectful and causes unnecessary heartache for you and the resort owner! 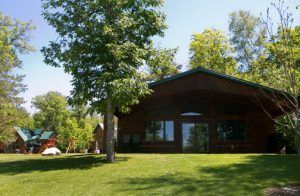 Not all cabins are at lake level. Think about whether or not everyone can walk up and down a hill or steps. Mobility – Consider the mobility of those with whom you are vacationing. Can Grandma handle stairs? Can everyone cope with a long walk from the cabin to the lake or can all members of your party walk up and down a hill to get to the lake? If you travel with someone who uses a wheelchair or walker ask about the width of doorways in the cabins and whether or not there is a bedroom and bathroom on the main level. Accommodations – Consider the type of accommodations you like on your vacation. Do you enjoy staying in a classic cabin that reminds you of vacations you took as a kid? 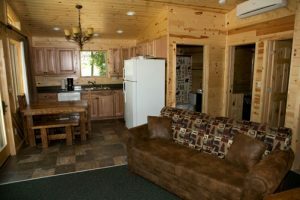 Or do you prefer newly constructed cabins with more modern conveniences? Perhaps you’d like a combination of those two styles! Along with the cabin atmosphere think about the amenities you want while vacationing. Do you need Wi-Fi in your cabin or would it be nice to get the family off of their devices and into a card game?! Think about dishwashers, Jacuzzi tubs, fireplaces and cable TV. Are those things important? What outdoor amenities make you happy: A private location? Your own fire pit? A gas grill? Take time to think about everyone in your party and consider the type of cabin that makes the most sense. 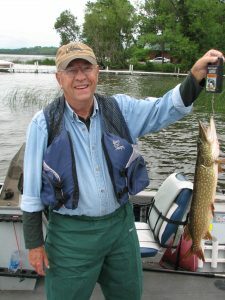 The lake is important for recreation as well as fishing! 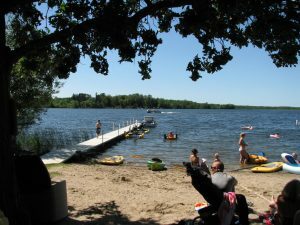 Lake – The lake really plays a big part in your vacation satisfaction if you plan on playing in or on the lake. With more than 10,000 lakes in Minnesota it’s easy to get overwhelmed when thinking about the lake on which you’d like to stay. Some lakes are large bodies of water that offer a lot of fishing variety and space for recreation. 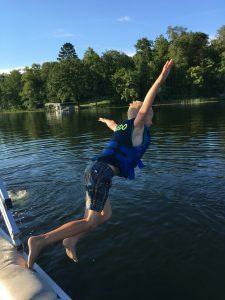 However, a large lake can also be harder to navigate and, occasionally, can be un-useable if the wind creates waves that makes boating unsafe. Ask if the lake has any invasive plants or invasive aquatic species. 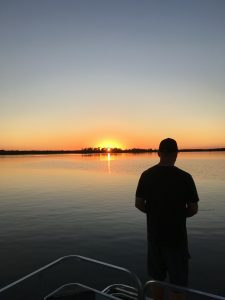 Many lakes already have an invasive of some kind so it doesn’t have to be a deal-breaker but invasives can play a part in the quality of fishing or recreation. It will also determine whether or not you need to decontaminate your boat upon leaving the lake. If your family fishes then choose a lake that offers good opportunities to fish for your favorite species. If you love fishing for Muskie then pick a resort on a good Muskie fishery. If recreation is your goal then make sure to ask if it’s ok to water-ski or tube on the lake. ALWAYS ask if the resort or lake allows jet skis before renting some or hauling yours up to the lake. Not all resorts allow them and some private lakes ban them completely. Ask, in general, how much boat traffic the lake gets because lots of boats make fishing and recreation more challenging. Are you willing to pay more for a modern cabin or more amenities? 1) How many people are included in the base cabin rate and does the resort charge for children? Try to break the costs down to a “per person” rate so it’s easier to compare the cost of the resorts you are considering. 2) How much deposit is required to secure the reservation? Is it a refundable deposit? Does the resort require payment in full before your stay? Does the resort run a tab or do you need to pay-as-you-go for things like bait, gas and ice cream? Consider looking into trip insurance if the thought of a non-refundable deposit scares you. 3) How much tax is charged? Is there a Lodging Tax or Fee in addition to state sales tax? Ask what your total charge will be (including tax) for lodging and boat rental. That way you won’t be unpleasantly surprised by the bottom line upon arrival! 4) If you bring your own boat is there a dock fee? Can you bring more than one boat and, if so, is there a dock fee if you bring a second boat? Is there a boat launch on site? Can you charge your boat batteries at the dock? 5) If you are renting a resort boat ask if the quoted rate includes gas or if gas is extra. 6) Does the resort sell gas, bait, ice, grocery items, firewood, ice cream, etc.? Are there places nearby to buy those items if you don’t want to or can’t buy them from the resort? 7) Does the resort charge for use of water toys like SUPs or are they free? Do you love campfires? Ask if your cabin will have it’s own firepit. 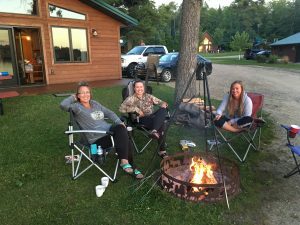 Miscellaneous other stuff – If campfires are important to you ask if the resort has private campfire rings at each cabin or if all are community fire rings available for everyone to use. Do not assume that you can bring your own firewood. Most resorts comply with the MN DNR’s request to only use local firewood to prevent the spread of the emerald ash borer. Ask if you can bring your own firewood or does the resort require you to buy firewood from the resort. 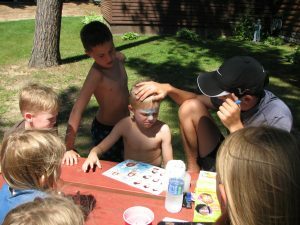 Ask the resort if there are scheduled activities for kids, adults and/or families? Perhaps ask “What is there to do on a rainy day?” Are there board games, puzzles, books, or other indoor activities available at the resort? Take time to think about whether or not it’s important to have golf, shopping, attractions or a movie theatre nearby. Finally, make sure you know what items are provided for you in the cabin so you know how to pack. Ask about towels, toiletries, bedding, toilet paper, garbage bags, dish soap, coffee filters, tissues, papers toweling, lawn chairs, alarm clocks, and radios. Ask if there is a BBQ grill. If so, is it gas or charcoal and do you need to provide your own gas or charcoal? 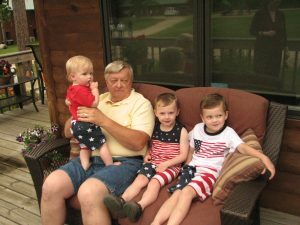 Memories made on a MN family vacation last a lifetime! Phew! That’s a lot to think about (and some of it seems obvious) but considering the supreme importance of your family’s summer vacation it’s a good idea to do some extra planning. It will ensure a good fit between you and the Minnesota resort you choose. But here’s the single biggest, most important thing of all to remember about planning a Minnesota family vacation: JUST DO IT! I promise that you won’t ever regret the time spent with family and friends and the memories made together. Ask if the resort has planned activities for the kids! Make sure the lake you choose offers you the fishing opportunities you want!